Today’s first reading is a beautiful invitation to enter into a relationship with the Living God. It is an invitation to you and me. Seek the Lord while He may be found; call to him while He is still near. So shall my word be that goes forth from my mouth; it shall not return to me empty, but shall do what pleases me, achieving the end for which I sent it. Who is invited? The first type of individual is the thirsty and the dead-broke. All you who are thirsty, come to the water! You who have no money, come, buy grain and eat; Come, buy grain without money, wine and milk without cost! At the end of the day, week even month that you are going down a dead-end street again and again. We may feel empty, unfulfilled, dissatisfied. Always knowing, sometimes just hoping, that there has to be more to this life we live. Why spend your money for what is not bread; your wages for what does not satisfy? The first type of person has nothing while the second is someone who has money, who has the strength to labor. The first kind of person is spiritually bankrupt and knows it. They are thirsty and broke. But the second kind of person isn’t there yet. He’s got money and he is spending it. He’s got strength and he is laboring. But to what end…utter frustration. The self-sufficient person isn’t like the other guy burnt out, anxiety ridden, at the end of their rope. No. This individual is still working, dreaming, chasing, searching, experimenting—different job, different city, different car, different house, different wife, new computer, new boat, new books, new bike, new grill, new season tickets, new diet, new looks—there’s still a lot of looking around left in this person. The chateau is boring and the boat is just a large toy. We are always trying to replace our Lord with fleeting relationships and things. And yet, these “things” are just a medication for a thirsting that can only be quenched by the Real Thing! If we are honest, all of can find ourselves in one of these two caricatures. And so, where does this leave us? Our hearts are restless O God until they rest in thee. Isn’t this what Isaiah is encouraging? To seek after Him. To Come to Him while He is still near. We are never so close to our Lord but in Holy Communion and through suffering. Never be satisfied for something less than divine. For my thoughts are not your thoughts, nor are your ways my ways. For as the heavens are higher than the earth, so are my ways higher than your ways, my thoughts higher than your thoughts. The invitation today is from the one who declared Himself to be Living Water and the Bread come down from Heaven. So where do we go from here? It does not matter your age, income or where you are spiritually. There is always more and he will bless you richly. Is that not what was proclaimed in the gospel? Only listen to me, and you shall eat well, you shall delight in rich fare. This Gospel every year frightens me. And, for you to understand why, I need to provide a context. For some reason, we have been taught that Jesus teaching through parables was because He was a brilliant story-teller – and He is a brilliant narrator and orator. That being said, Scripture paints a very different picture. Scripture tells us that in the beginning of Jesus’ ministry He taught with straight-forward plain speech. Then suddenly, He started using parables. Why? Scripture says that after the Jews and their leaders accused Him of being Beelzebub (Matthew 12:24-27 and Mark 3:22), or the devil, and as a result, He no longer taught plainly in public (Matthew 13: 10-11). He would then teach openly with a parable and then explain it to His disciples in private. Parables are meant to confuse the wise but instruct the humble. Take for instance the parable of the prodigal son. Did you realize that the story is not about the younger son who walked away but the older who did not? The ground in the parable is our hearts while the seed is the Word of God. Notice that Jesus does not say Scripture but word. As Catholics we are not People of the book. We are People of the Word. The Word is more than Sacred Scripture. It is the teachings of the Church, our liturgies, it is the Creed, and it is our Tradition. Most importantly, to be People of the Word of God is to be People of THE Word of God – Jesus the Christ. The world is begging to hear God speak to it. I am quite sure that the majority of us here want to hear Jesus speak to us. We want to grow in our faith. The fact is that he IS speaking….through the liturgy, Scripture, this most righteous homily, and may even – when we are formed by His word, even us. Our Lord is asking us today to open our ears to hear Him. You may say, “Deacon, He does not speak to me!” I have never met a person who really wants to hear our Lord ever be disappointed. So what prevents it? There a number of reasons but let’s quickly look at one or two. Silence in the presence of the Lord God! For near is the day of the Lord…He has prepared a feast and consecrated His guests. I am the Lord your God, there is no other. I am God and there is none like me. Be not anxious for tomorrow for today has enough of its own. How about Matt 12:36 I tell you, on the Day of Judgment people will render an account for every careless word they speak. By your words you will be acquitted and by your words you will be condemned. The hardest one is: I have loved you with an everlasting love. In other words, our faith is increased through hearing, obeying and loving His word. Blessed Mother Teresa heard, “Feed my poor” and the Missionaries of charity were born. Francis heard give away everything you have which allowed him to hear the next word, Go and rebuild my Church…And the world has never been the same since. My word does not come back void but does my will and accomplishes the task it was sent forth to do. The queen of diamonds is Rachel, wife of Jacob whose twelve sons founded the twelve tribes of Israel. The king of hearts is Charlemagne. The king of diamonds is Julius Caesar. The king of clubs is Alexander the Great. The queen of hearts is Judith of Bavaria, a daughter of Charlemagne. 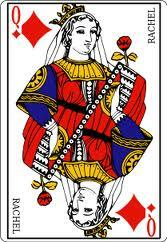 The queen of spades is Palias, Greek goddess of war and wisdom (the Latin Miverna). The queen of clubs is Marie d’Anjou (at least according to tradition), wife of dauphin Charles VII. The jack of hearts is La Hire, a 15th-century French warrior. The jack of spades is Hogier, one of Charlemagne’s paladins (one of the twelve peers or knight companions of legend attending Charlemagne). The jack of diamonds is Hector, or Roland, or possibly half-brother to Lancelot of the Round Table. The jack of clubs is Lancelot, a knight of King Arthur’s Round Table. As we have been discussing, a covenant includes mediation of a single individual for the entire people – by a High Priest. All the former covenant curses the Christ absorbed for His bride. Why? In order for the curses to be lifted, and the human race to continue, either God or all of Israel had to die. Our Lord’s humanity, taken on by a divine person qualified to settle a divine debt. It was always in His deliberate plan of attack – the enemy had no idea. More importantly, he had no idea that our Lord would resurrect. The Warrior’s game plan was to yield Himself completely, totally, and without reserve. It is at this point that the Warrior became the Bridegroom. That is what the Bridegroom does for His Bride. He offers himself in a complete exchange of persons. What our Lord experiences eternally in the Blessed Trinity, He now brings to earth for us to participate in and experience a foretaste of the life to come. Scriptures says that early on the morning of the first day of the week (Mt 28:1, Mk 16:1-2, Lk 24:1, and Jn 20:1) an earthquake took place (Mt 28:2-4) and rolled the stone away (Mt 28:4, Mk 16:4, Lk 24:2, and Jn 20:1). The gospels recount that the ones who came into the garden to anoint the Lord were women. Had Adam defended Eve, he too would have found his bride coming to anoint his body. Many Rabbi’s even suspect that the Tree of Life, which was in the Garden of Eden, could have brought the First Adam back to life. The Garden of Eden was also the primordial seed of all creation. It was there the God gave all creation to Adam in order for him to adovah (work) and shamar (protect). The Father also turned the garden into a temple by making it holy on that seventh day of creation. After a short slumber, induced by God on day six, Adam awakens to find His bride before him in a temple (also known as a Church) on the Sabbath. It is no wonder that the Christ finds more than one Eve in the garden this morning. On Good Friday, the Church was birthed. His bride was no longer one person but the Church as a whole. This is symbolically shown by the three women in the garden. And how do we know it was love at first sight? The women immediately run to the disciples to tell them that they have seen the Lord (Mt 28:8, Mk 24:9). They run to tell the disciples. LOVE NEVER CONCEALS ITSELF! Someone in love cannot help but share the love that they received through their words, actions and yes, their very person. What is the message? The Bridegroom is awake, He is here! More importantly, two of the Gospels say that our Lord appeared to Mary Magdalene (Mk 16:9 and Jn 20:14-17) who ran to tell Peter and John (Jn 20:2). Our Lord desires a spotless bride and Good Friday is proven effective in the person of Mary Magdalene. Scripture then says Peter and John ran to the tomb. (Jn 20:3-4) John arrived first, knelt down, saw the linens, and believed. He did not enter though. He waited for Peter. (Jn 20:4-8) So it is with all true mystics of the Church. They may arrive first at understanding what our Lord is saying or doing but always wait for Peter and the Church to investigate and believe. What did Peter and John see that made His resurrection so believable – besides the fact that He foretold it? The following are a few thoughts from Peter and John’s view. The sepulcher was a newly carved tomb (Jn 19:31). Archeologists tell us that the Jews had some interesting beliefs about the dead and where they buried them. In the Jewish burial ritual, the body is placed on a carved out rock table in the center of the cave. Along the edges of the cave, boxes would be carved out where the bones of their ancestors were place. The Jews would come back to view the body on four separate occasions over an eighteen month period. The quicker the body decayed the more sin the individual committed in their lifetime. So, what does it say that not only did Jesus’ body not decay but instead resurrected? It confirms the belief from the earliest Christian times that Jesus not only did not sin but He did not possess Original Sin. Not sinning would only mean His body would not decay. Resurrecting on the other hand, that would mean the chains of Original Sin that bound us to death did not bind Him at all. Additionally, Jesus was laid in a tomb with no bones of His forefathers. Scripture gives no indication that they planned to move His bones like Joseph (Gn 49:29-32) or David (1 Kings 2:10), to be put to rest with His forefathers. This detail provides a two-fold meaning. The first is that He had no ancestors. 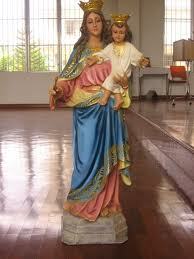 It is true that Mary is His mother who determines His Jewish heritage but He was conceived by the Holy Spirit. He is the Alpha and Omega the Beginning and the End (Rv 1:8) – the divine nature of the second person of the Blessed Trinity has no ancestors. He always is. The second relates to the new order of creation that Jesus established by His resurrection – He is the First-born of the Dead (Rv 1:5). The new Adam (1Cor 15:45) has established a new race where all find their heritage in Him. Why is it so important that the cloth that covered the head was separate and rolled up and not with the other cloths? Grave-robbers only broke in to steal the head cloth which was made of fine linen and could be sold for a large sum of money. They also would leave the body in the tomb. Rolled up is also an important detail. We would say folded neatly. Robbers do not fold and if they do, it is in haste. Our Lord wanted to make it clear that no grave robbers were here. As we have noted in the past, Scriptually speaking, gardens are only meant for the consummation of love between the Bridegroom and the Bride. In times past, the enemy has been a source of division and fear within the garden. Today is a new day and the enemy has everything to fear. The reign of Christ the King has begun. The accuser of the breathern has been cast out. Here today, the Warrior-Bridegroom appears perfectly healthy and the enemy and his minions, they find themselves defeated and cowering in fear. To add insult to injury, the Lord rises with glorified wounds. Why? To remind the enemy that the mortal wounds He received have begun the salvation of all mankind of course. They were the wedding present of the Bride to her Bridegroom which He shows freely with pride and honor. The devil had played right into the Father’s plan. So this Lent, eat some Tempura…a food born out of our Catholic Christian tradition! Did you know that you are a resident alien? That is what the word parishioner means. It comes from the Hellenistic Greek word παρоικια. The word was used in the Septuagint to describe the Jews as sojourners in a foreign land (cf. Gen 15:13, Exd 6:4, Deu 10:19). It is of the essence of the Church that she be both human and divine, visible and yet invisibly equipped, eager to act and yet intent on contemplation, present in this world and yet not at home in it; and she is all these things in such wise that in her the human is directed and subordinated to the divine, the visible likewise to the invisible, action to contemplation, and this present world to that city yet to come, which we seek. Naturally, we should feel most at home during the liturgy when heaven and earth embrace through the Divine Mysteries. Did you ever wonder why we have a procession for anything and everything we do? We enter those Divine Mysteries through processions or as it is defined: an assembly on the move. On the move to what, where or whom? To the true love of our hearts, heaven, and the Most Blessed Trinity. Next time you go to Mass remember that you are truly home in the Church. Additionally, as you consider the challenge(s) that the U.S. is grappling with concerning immigration (legal or otherwise) remind yourselves that you too are a sojourner in a land that is not your own. What Made Our Lady Great? On at least two occasions, while teaching dramatically, as He often did, when a woman said: “Blessed is the womb that bore you, He replied, “Rather blessed are those who hear the word of God and obey it”(Lk.11:27-28). Similarly, when His Mother had come to see Him when He was preaching, He said (Mk 3:35): “Whoever does the will of God is my brother and sister and mother.” Vatican II explained well (LG § 58), “as she was faithfully doing.” In other words, out of two dignities, being the Mother of God, and doing the will of God, the second is greater. Yes, the first is so great that Pius XI said (Lux veritatis, Dec. 25, 1931, citing I.25.6.ad 4) that she “has a sort of infinite dignity from the infinite good that God is.” Yet it is still greater to hear the word of God and keep it. She is at the peak in both categories, but of the two, the greater is to hear the word of God and keep it. Her holiness, even at the start of her life, wrote Pius IX (Ineffabilis Deus), is so great that “none greater under God can be thought of, and only God can comprehend it”. Fr. Paul Scalia, Pastor at St. John the Beloved in McLean, Virginia, wrote a beautiful Gospel Commentary on Matthew 5:13-16 entitled, A Modest Apostolate, in the Arlington Catholic Herald this week. Enjoy!!! Do not put too much salt on your food. It is bad for your heart. Besides, it ruins the taste. And do not blind people with lights. The best lighting is gentle and indirect. Turn your high beams down when traffic is coming. No one likes a klieg light shining in his face. Now, this advice might (or might not) be helpful for your daily living. But it can help us understand what Our Lord says about us: “You are the salt of the earth. … You are the light of the world” (Mt 5:13,14). His words describe the relation of Christians to the world: salt to flavor it and light to brighten it. But these images also capture how modest and unassuming evangelization should be. There is a place, of course, for the large and dramatic efforts to win souls for Christ. The grand presentations can be effective. But they come and go, and people still need to encounter Christ in the ordinary. What is needed in daily life is an evangelization that is a subtle, indirect and gentle. Most of us are called to bring souls to Christ not on a large stage but in very ordinary circumstances — in the home, at work, on the bus, etc. And for that modest apostolate we do well to heed the subtlety of salt and light. Salt, first of all, works best when it is not noticed. It is not meant to call attention to itself but to the flavor of the food. It works best when it disappears into the food. So also the Christian works best when he gives a natural, peaceful and gentle witness, bringing out the goodness, truth and beauty of God’s creation without calling attention to himself. A faith worn comfortably and peacefully is perhaps the greatest witness that can be given. A charitable word, an act of patience, a small sacrifice — these are like salt that goes unnoticed itself but brings out a greater flavor. People should take more notice of God than of us. They should taste the goodness of the Lord. We are only there to bring out that goodness. Light likewise works best when it is indirect. A lamp is meant to call attention to the things around it, not to itself. So also the light of evangelization ought to differ from the light of interrogation. The light of Christ should not blind others. Rather, it should gently illuminate what is good and bring out its beauty. The brash and pushy Christian usually has the same effect as a spotlight: It makes people close their eyes. The indirect and gentle light given by a calm and peaceful Christian life entices more than the glare of stage lights. The subtlety of the apostolate has eternal significance. But it carries more importance perhaps for us, because we live in such an immodest culture. Everywhere we are encouraged to advertise and promote ourselves. Now everyone can have a web page all about himself. And in the midst of this, our witness to Christ is lost. We more than our predecessors, therefore, need to learn the importance of the modest apostolate that calls attention not so much to us as to Him. Our Lord summarizes this evangelical modesty by saying, “Your light must shine before others, that they may see your good deeds and glorify your heavenly Father” (Mt 5:16). They see our good deeds — which may be very small indeed — but it is our Father in heaven Whom they glorify. In short, those good deeds — so much salt and light — bring people not to us but to Him. Fr. Scalia is pastor of St. John the Beloved Parish in McLean. There are many problems in the Catholic Church that might be thought to be the ‘smoke of Satan’ entering the church, but for my money one thing, above all others, has been the successful work of Satan, which has undermined the church, emasculated her ministry, sabotaged the aims of the Holy Spirit and captured a multitude of souls. It is the modernist re-interpretation of the Catholic faith. The reductionist results of modern Biblical scholarship and the infiltration of a modernist, rationalistic and materialistic mindset meant that the supernatural was assumed to be impossible, and therefore the Bible stories (and also any supernatural elements of the faith) had to be ‘de-mythologized.’ Everything supernatural within the Biblical account and within the lives of the saints and within the teaching of the church were assumed to be impossible and had to be ‘re-interpreted’ so they would make sense to modern, scientifically minded people. It’s the smoke of Satan, and it’s virtually triumphant within the mainstream Protestant churches, and sadly, the modern Catholic Church in the USA is riddled through with the same noxious heresy. The reason it is so obnoxious and disgusting is because priests and clergy of all sorts still use all the traditional language of the liturgy, the Scriptures and the creeds, but they have changed the meaning of it altogether. They never actually stand up and say that they have changed the meaning, and that they no longer believe the faith once delivered to the saints. They don’t discuss the fact that they have not only changed the meaning, but robbed it of meaning altogether. Instead they still stand up week by week and recite the creed as if they think it is true, but what they mean by ‘true’ is totally different from what their people mean. So ‘Father Flannel’ stands up on Easter Day and says, “Alleluia! Today we rejoice in the glorious resurrection of Our Lord Jesus Christ from the dead.” His people think he really believes that Jesus’ dead body came back to life by the power of God and that he went on to live forever. In fact what Father Flannel really means is that “in some way the beautiful teachings of Jesus were remembered and continued by his followers long after his tragic death.” The people don’t know why Father Flannel’s Catholic life is so lightweight and limp and they don’t know why his style is so lacking in substance, and they go on in their muddled way thinking that he really does believe the Catholic faith when, in fact, he doesn’t at all. Consequently, Fr Flannel doesn’t really have much of a message at all. He doesn’t believe any of the gospel except as some sort of beautiful story which inspires people to be nicer to each other. All that is left of his priesthood, therefore, is to be a nice guy to entertain people with inspirational thoughts and get everyone to be nicer to one another and try to save the planet. The poor faithful have swallowed this stuff for two or three generations now, and they don’t even know what poison they’re swallowing because the lies are all dressed up in the same traditional language the church has always used. It’s like someone has put battery acid into a milk bottle and given it to a baby, and never imagined that there was anything wrong with doing so–indeed thought it was the best thing for baby. The faithful don’t know why their church has become like a cross between a Joan Baez concert and a political activism meeting. They don’t understand why they never hear the need for confession or repentance or hear about old fashioned terms like ‘the precious blood’ or ‘ the body, blood, soul and divinity of Our Lord and Savior” The fact of the matter is Father Flannel doesn’t really think that sort of thing is ‘helpful’. This is why evangelization of the American Catholics in the pew is probably the most difficult task of all. They don’t know what they don’t know. For three generations now they have been given watered down milk and been told it was wine. They actually think that Catholic lite is what it’s all about, and are astounded to think that there are some of us who think that they have actually been fed a version of Christianity that is scarcely Christianity at all. So, how do we celebrate the feast of the Angelic Doctor, St. Thomas Aquinas? I thought we could listen to a homily by Fr. Kurt Pritzl, O.P., dean of the School of Philosophy at the Catholic University of America. His homily is a great tribute to the sanctity of St. Thomas and the intellectual knowledge that flowed from it. For more on St. Thomas, check out Catholic Online. Additionally, you can find a number of his works at the Christian Classics Ethereal Library. 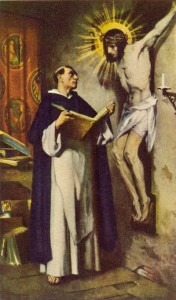 St. Thomas, ora pro nobis!